Just one month ago, the small town and school district of West, Texas suffered a horrendous tragedy, with the massive explosion that devastated much of the small town and the West Independent School District. My understanding is that the explosion devastated much of this district’s technology infrastructure, servers, and backups. And just now it is being reported that a lot of schools (and most likely their data) reside close to fertilizer storage across the country. And unfortunately this week in Oklahoma City, five schools were ravaged by a horrendous tornado. Data is unfortunately super easy to lose – if not to a major natural or other disaster, then just as easily to a failed hard drive, a broken water main, or a building fire. Whether you are a technology director, superintendent, or a classroom teacher, this is the perfect time to ask several questions, where are my files and systems backed up? Are the backups stored in different physical locations? Are the backups in a secured location? Can the backups be restored to a different place if needed? All of us need to be backing up our important digital assets (and our students’ assets.) Very few of our schools sit somewhere immune to natural disasters. San Antonio is thought to be a very good location in Texas much more immune to tornadoes and hurricanes than many parts of the state, such that we have many very large data centers here. 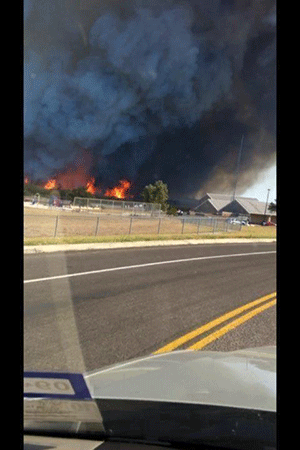 Yet the picture to the right is my son’s elementary school two years ago, with a major wildfire burning right behind it. I am sure the staff of the school never thought a fire would threaten them, yet it came so very close. So before travelling down to San Antonio to ISTE, please take a few minutes and backup your laptop, iPad, servers, etc. to another site or perhaps to the cloud, lest some unfortunate disaster strikes you or your school. Safe travels.